Cookie Domain: The cookie domain is used for either affiliate tracking links, conversion pixels or as a POST URL for server posting into CAKE. This domain is decided upon during the onboarding process. Session Regeneration Minutes: Duplicate clicks/conversions will not be counted if they occur within the specified time period. Users may override at the offer level. Global Redirect: The default URL where a customer is redirect on invalid/inactive links, after all Upsell and Redirect paths have been exhausted and when no Thank You Link is present. Paid Redirects: If selected, campaign redirects will be paid. Users may override at the affiliate level on the Affiliate card. Encrypt Links: If enabled, all generated unique links and click/impression pixels will be encrypted to hide identifying source information. Base Tracking Domain Redirect: The URL where a customer is redirected on clicks to a base tracking domain sans affiliate/query string info. If left blank, the Global Redirect will be used. Don't pay for Bot Traffic on CPC: If enabled, conversions will not be recorded from bot traffic on all CPC campaigns. Clicks will be recorded but without payment. If disabled, conversions will be recorded from my traffic on all CPC campaigns. Clicks will be recorded and paid for. Don't pay for Bot Traffic on CPM: If enabled, conversions will not be recorded from bot traffic on CPM campaigns. Impressions will still be recorded sans payment. Enable Events: Enable this option to add event tracking options. Child Click Inherits Parent SubIDs: When enabled the values of s2-5 on the child offer's click will be inherited from the parent offer's click (note: sub ids from the child offer will be ignored). When disabled, only s1 will be inherited and s2-5 will be taken from the child offer's click. Cap Percentage Threshold: This allows CAKE users to override the default cap threshold of 90%, to a different percentage. Example: setting this to 50% will trip the alert when 50% of the cap is reached. Global Pixels: Enables pixel placement at the affiliate, offer and global level. Global Pixel: Pixels placed here will fire on all offers unless otherwise modified at the offer or affiliate level. Postback URL: This URL will fire on all offers unless otherwise modified at the offer or affiliate level. Postback Delay (ms): The delay (in milliseconds) before firing the global postback upon any conversion. Fire Global Pixel By Default: If enabled, all new offers will fire global pixel by default. Fire Pixel on Non Paid Conversions: If enabled, the global pixel fires on non paid conversions. Pending Conversions: If enabled, all conversions will be sent to Queue. Default Approved: Sets the default disposition for auto approved conversions. Default Pending: Sets the default pending disposition for all conversions set for review at the campaign or affiliate level. 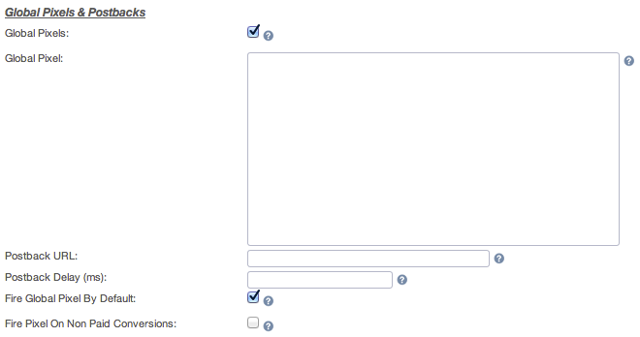 Default Rejected: Sets the default disposition for auto rejected conversions. Conversion Cap Behavior: This setting allows you to customize how incoming conversions are dealt with once a conversion cap is hit. Any new or existing offers not assigned an explicit conversion cap behavior will be defaulted to this conversion cap behavior. Conversion Behavior On Redirect: This setting allows you to customize how incoming conversions are dealt with when any redirect criteria is met (e.g. Inactive Affiliate, Expired offer), expect for conversion caps whose default behavior can be individually customized above. 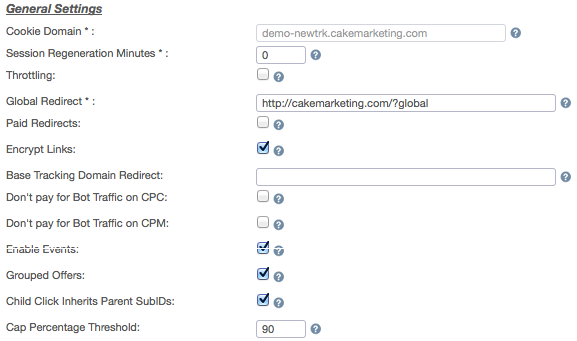 Any new or existing offers will be defaulted to this conversion behavior on redirect. Original Campaign by Offer Contract: Account for offer contract in original/non-original campaign creation. Original Campaign by Media Type: Account for media type in original/non-original campaign creation.